Rencana ini memerlukan kemaskini dalam Bahasa Melayu piawai Dewan Bahasa dan Pustaka. Sila membantu, bahan-bahan boleh didapati di Melanocyte (Inggeris). Melanosit (bahasa Inggeris: Melanocyte, disebut /mɛˈlænɵsаɪt/ ( dengar)) ialah sel yang terletak di lapisan paling bawah stratum basal pada epidermis kulit, lapisan tengah mata (uvea), telinga dalam, meninges, tulang dan jantung yang menghasilkan melanin iaitu sejenis pigmen. Melalui proses yang dikenali sebagai melanogenesis, sel-sel melanosit akan menghasilkan melanin, iaitu sejenis pigmen yang boleh dijumpai di bawah kulit, mata dan rambut. Melanogenesis ini menyebabkan keperangan kulit yang berkekalan berbeza dengan keperangan yang berasal dari pengoksidaan melanin yang telah wujud. There are both basal and activated levels of melanogenesis; lighter-skinned people generally have low basal levels of melanogenesis. Exposure to UV-B radiation causes an increased melanogenesis as a response to DNA photodamage. Since the action spectrum of sunburn and melanogenesis are virtually identical, it is assumed that they are induced by the same mechanism. The agreement of the action spectrum with the absorption spectrum of DNA points towards the formation of cyclobutane pyrimidine dimers (direct DNA damage). The acronym for cyclobutane pyrimidine dimers is CPDs. Di dalam satu milimiter persegi kulit, terdapat biasanya lebih kurang 1000 ke 2000 melanosit dan meliputi kira-kira 5% ke 10% sel-sel pada lapisan terkematu epidermis. Biasanya, melanosit adalah sebesar 7 mikrometer walaupun saiznya mungkin berlainan. The difference in skin color between fair people and dark people is due not to the number (quantity) of melanocytes in their skin, but to the melanocytes' level of activity (quantity and relative amounts of eumelanin and pheomelanin). This process is under hormonal control, including the MSH and ACTH peptides that are produced from the precursor proopiomelanocortin. Albinos lack an enzyme called tyrosinase[meragukan – bincang]. Tyrosinase is required for melanocytes to produce melanin from the amino acid tyrosine. Numerous stimuli are able to alter melanogenesis, or the production of melanin by cultured melanocytes, although the method by which it works is not fully understood. Melanocortins have been discussed by biologist James D. Watson to have effect on appetite and sexual activity. Vitamin D metabolites, retinoids, melanocyte-stimulating hormone, forskolin, cholera toxin, isobutylmethylxanthine, diacylglycerol analogues, and UV irradiation all trigger melanogenesis and in turn, pigmentation. 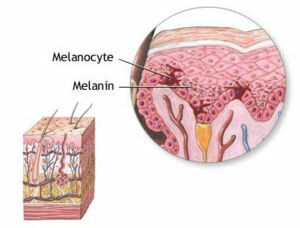 The production of melanin is also initiated by ACTH (an adrenocorticotropic hormone). Once made, melanin is moved along arm-like structures called dendrites in a special container called a melanosome which is shipped to the keratinocytes. Melanosomes are vesicles or packages of the chemical inside a plasma membrane. The melanin is in organelles called "melanosomes", that are organized as a cap protecting the nucleus of the keratinocyte. When ultraviolet rays penetrate the skin and damage DNA, thymidine dinucleotide (pTpT) fragments from damaged DNA will trigger melanogenesis and cause the melanocyte to produce melanosomes, which are then transferred by dendrite to the top layer of keratinocytes. ^ Barden H and Levine S (1983). "Histochemical observations on rodent brain melanin". Brain Res. Bull. 10 (6): 847–851. doi:10.1016/0361-9230(83)90218-6. PMID 6616275. ^ Markert CL and Silvers WK (1956). "The effects of genotype and cell environment on melanoblast differentiation in the house mouse". Genetics. 41 (3): 429–450. PMID 17247639. ^ Mintz B (1971). "Clonal basis of mammalian differentiation". Symp. Soc. Exp. Biol. 25: 345–370. PMID 4940552. ^ Nichols SE and Reams WM (1969). "The occurrence and morphogenesis of melanocytes in the connective tissues of the PET/MCV mouse strain". J. Embryol. Exp. Morphol. 8: 24–32. PMID 14426921. ^ Theriault LL and Hurley LS (1970). "Ultrastructure of developing melanosomes in C57 black and pallid mice". Dev. Biol. 23 (2): 261–275. doi:10.1016/0012-1606(70)90098-9. PMID 5476812. Templat:BUHistology - "Eye: fovea, RPE"
Templat:BUHistology - "Integument: pigmented skin"
Laman ini diubah buat kali terakhir pada 12:31, 10 Mei 2017.